Hello and welcome to the first week of Neon Month! 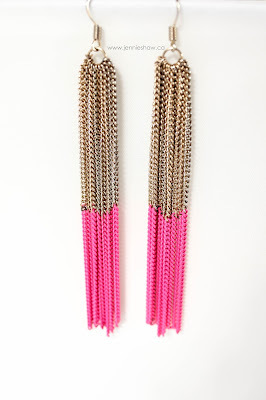 One of my favourite pieces of jewelry is a pair of earrings I've had forever, and since they're all sorts of pink neon goodness, they served as the perfect piece of inspiration for our first neon week. Ugh. Why is it so hard to get a good picture of neon amazingness? I swear that in real life, these babies are super neon. Because I've had these earrings for so long, the metal bits have tarnished, but that's just made them cooler. To reflect the variety of colour, I used gold, silver, and pewter polish and I loooooooove how they look together. After my base of Paper Mache (two coats) was dry, I used a medium dotting tool to make three lines of dots on each nail with Rollin' in Cashmere, My Silk Tie, and Gossip Over Gimlets, and four dots on my middle finger (because I can't not have a feature finger, even if it's so subtle that nobody but me would probably notice, haha!). Then I added the pink dots. The tricky part came next because I had to centre a smaller white dot in the middle of each larger dot. So after some wine I chose the smallest dotter I had and prayed to the Steady Hands Gods. I was so nervous, in fact, that I literally held my breath for each dot. Haha! What an unexpectedly high-stress mani! Anyway, I eventually made my way down each line, and when I was done, I waited for a long time before adding a coat of quick-dry top coat, as this mani took a while and I wasn't about to have any smudging. Ha! I love how it turned out and although it's basically impossible to get a picture that shows how bright this neon pink polish is (trust me, it's briiiiiiiight) it still looks pretty good. The pewter dots give off a bit of sparkle, and it all really pops against the white base. What are you rocking this week? Were you inspired by Neon Month? Link up and show off! I NEVER would've considered how those dot-inside-dot manis can look like chain links. Love it! I've also gotta say, I love how you clean your nails up. Does that sound weird? When I try to do that with a brush and some remover, it takes AGES and never looks that good. How do you do it?? Anyway, if I hadn't just packed up my polish last night, I would totally use this inspiration to make a chain mail mani. Or maybe accent nail, 'cuz that seems like a lot of fine detail work. But now I'm thinking...a mani inspired by medieval knights? Hmmm.....thanks, as always, for the prompt AND the inspiration! I love the way you mix colors. I'm not so good at that. I love that pink. the nail files: tennis, anyone?